The Attic is a Kontakt instrument from Soniccouture crammed with the sort of dusty old gear many of us would love under our roofs. None of its featured instruments are faithfully modelled recreations of those originally sampled; what you get instead is the distinctive flavour of early electronics ready to permeate any project. The relics whose souls have been plundered are as follows: EMS Synthi AKS, Roland SH2000 and RS202, Godwin String Concert, Korg LP10 Electronic Piano and the Minikorg 700, Jennings Univox, Suzuki Omnichord, Philips Philicorda and Hammond Solovox. With individual note captures from all and high-quality samples and loops throughout, it's no wonder the Attic is a whopping 8GB. Most of the material is regular and musical, but as the Synthi is present, you should also prepare yourself for a selection of distorted loops, swarming alien insects and general wonky brokenness. Having installed the Attic in Kontakt 5.1 (or the free Player version) you're presented with a dozen basic instruments, each with instantly recognisable graphics based on the source machines. In most cases bonus features are supplied, some bold and obvious, others tucked away behind small clickable square icons. For example, lurking behind the EQ section of the Korg piano is a low- and high-pass filter, complete with keyboard tracking and velocity response — all worthy enhancements. Supplementing the base instruments, six further folders of presets are provided, each brimming with example patches, some of which are very good indeed. Perhaps I'm biased, since the Synthi AKS is my all-time favourite synthesizer, but I couldn't resist starting with the three Synthi-based instruments. The first is 'Hits & Ambiences' and right away I saw it contained a lot of samples; more than the 128 a MIDI keyboard can theoretically address! Thankfully you can select the overspill manually and, if you click the 'focus' switch, the currently selected sample will be mapped across the keyboard, ready to play polyphonically. This assumes you want to play the various blips, rattles, whistles, alarms, sweeps and dentist drills polyphonically, of course. It's also not merely a preset machine; there are a handful of tools ideal to manipulate the raw samples (but not so many you'd lose interest in doing so). Even the maddest Synthi recordings can be transformed by extreme transposition, filtering and modulation. Next, the Synthi 'Loops' could have been plucked straight from a BBC Radiophonic Workshop session. I have my doubts about how generally useful the loops are, but had to smile at the homage to Pink Floyd and the inevitable 'On The Run' sequence. The loops are also available in WAV, REX and Apple Loop format. Far more versatile are the Synthi 'Multisamples' in which the aging EMS is coaxed into roles it usually shies away from — playing musical notes. 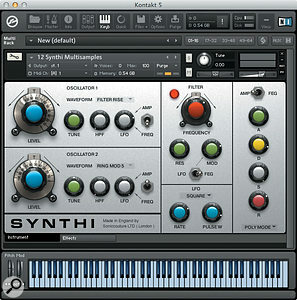 This Kontakt instrument has two oscillators, each with a choice of 25 waveforms ranging from the conventional to the bizarre. The included filter isn't particularly Synthi-like but it's not bad and the components add up to a strangely compelling synth, which becomes more straightforward to operate once you realise the modulation amounts are bi-polar. Anyone requiring a dash of analogue insanity should find plenty of it here, bottled and ready to go. Continuing with my theme of favourites, the Godwin String Concert must be one of the best unknown string synths ever made, not least because its sliders introduce chorus and tremolo gradually, which is so much nicer than on/off switches. Its deliciously long attack and release times (release is labelled as 'sustain') are also unusual and fabulous. Admittedly, this version doesn't quite match the Godwin in richness, but the custom-made chorus and tremolo is backed up by secondary sliders for pitch drift and width of the chorus effect. The end result is a very serviceable string machine. As an alternative, the RS202 was one of Roland's earliest string/brass combos. Here it is improved by the addition of a filter, velocity sensitivity and a two-stage ensemble. Again it's not an exact rendition but it's at least as sonically interesting as the original. Korg's LP10 was a curious electronic piano that looked better than it sounded. It had three tones: clav, piano and electric piano, all of which could be used at once in a doomed attempt to beef it up. Here, thanks to the detune, EQ and filter section, plus more envelope control than a piano typically receives, the LP10 is a source of passable, if still woolly, sounds; more so when you start to introduce effects. Having mentioned the effects a couple of times, I should clarify that all the instruments have a common rear panel in which effects can be engaged. Soniccouture have covered most bases, so you'll find a combined low-/high-pass filter, chorus, phaser, amp and Leslie speaker simulations, plus overdrive, convolution reverbs, delay, compression, saturation and EQ. To maintain the character of the base samples, less is definitely more, but the effects ensure you can get far more from them in the long run. Switching back to the instruments, the Suzuki Omnichord dates from the early 1980s and features chord buttons and a touchplate to strum them. With just two basic synth tones, it shouldn't have been anything special yet it possessed a certain ethereal quality and the strummer was wonderful (replicated here by the mod wheel). Amongst the presets, I discovered an Omnichord patch called Tickler which has an extra panel: 'Wobbler'. This feature simulates movement of the mod wheel and applies a shimmering, tinkering sequence to any notes you play. It's lovely. The remaining instruments are two Japanese monosynths that aren't as sought-after as they probably should be. The character of the Minikorg comes through rather well, its bright, punchy sound proving especially effective when used polyphonically. Some of the Attic's finest string and pad presets are based not on the two string machines, but on the rich Minikorg PWM samples. 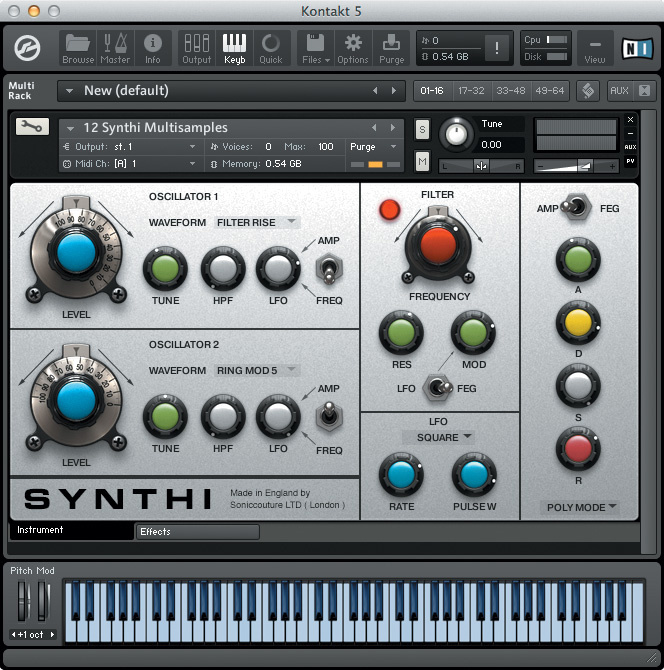 As with all monophonic synths, the Kontakt format isn't ideal because Kontakt's envelopes are of the 'start at zero' type, which tends to thwart accurate reproduction of anything other than patches with a fast attack. Lastly, Roland's SH2000 with its expressive aftertouch and patches such as 'frogman' and 'funky cat', played a significant role in luring me away from organ lessons in my youth. Here, two banks of presets offer the expected assortment of trumpets, cellos, flutes and banjos. Perhaps surprisingly, there's no polyphonic mode and I found it fairly muted and polite next to the Minikorg.